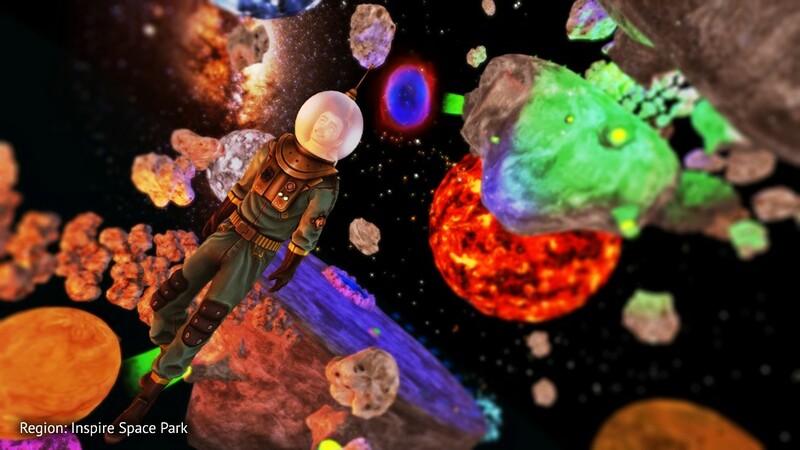 The latest installment of Draxtor Despres’ great series, profiling some of Second Life’s most creative people, is here! Episode 11 of The Drax Files: World Makers focuses on the Dwarfins. below, and be sure to check out the Dwarfins inworld! New to the Drax Files? Catch up on previous episodes at Drax’s website or at the links below! Today, we’re introducing Second Life Share or SLShare for short. 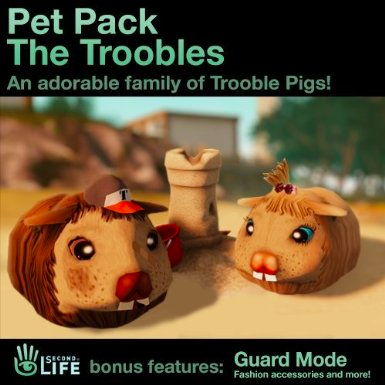 It’s a new feature that makes it easy to share things from Second Life with your friends on Facebook. SLShare is a new, 100% opt-in Viewer feature that will allow you to easily update your Facebook status, share photos, and check-in from Second Life locations to your Facebook wall. Whether you’re at a great inworld event and want to let your Facebook friends know where to join you, want to show off a photo of your avatar modeling your latest Marketplace purchase, or just share a thought inspired by your inworld explorations, SLShare makes it easy to share pieces of your Second Life experiences with your Facebook network. SLShare isn’t yet available for everyone, but starting today, a certain percentage of users will begin to be able to access the feature, and we’ll soon rolling it out to everyone. UPDATE - Oct. 1, 2013: we're ready to expand the testing group for SLShare! If you'd like to give it a try, you can download the RC Viewer with SLShare feature here. 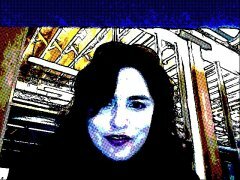 New Video: What’s New in Second Life? We’ve just published a new video that briefly highlights a few of Second Life’s recent improvements and new features. If you’re a follower of this blog, the content will probably be familiar - it includes initiatives like Project Sunshine and SLShare - but we all occasionally meet someone whose notions of Second Life are a little (or more than a little) outdated, and we hope this video may help get them more up-to-speed on what Second Life is like today. below, and share it with your friends! Following the recent update to the Second Life Terms of Service, which disallows trading of Linden dollars (L$) on third party exchanges, we’ve heard from some users outside of the US who are concerned that it may now be more difficult for them to purchase L$ to use in Second Life. Now, to give users more options and make it easier to purchase L$, we’re launching a pilot program of Authorized Resellers of L$. These sites are authorized by Linden Lab to purchase L$ on the LindeX and then resell those L$ using a variety of international currencies and payment methods. To be clear: per the Terms of Service, these resellers will not be allowed to purchase L$ outside of the LindeX (i.e. they will not be able to buy L$ back from users and cash people out). The list of Authorized Resellers participating in the pilot program is available here. If you would like to receive an application to the program when it formally launches, please send an email to LDollarSeller@lindenlab.com. We know that users are also concerned about the length of the LindeX’s cashout process and the limited choice of currencies when selling L$. We’re currently investigating ways to improve that experience for users while still providing superior fraud protections, and hope to hasten the cashout process and offer new currency options in the future. If you who haven’t yet heard, we’re coming up on the Second Life’s tenth birthday, SL10B as we’ve affectionately dubbed it. While we’ve got a whole slew of celebrations planned, we’d really like to see how people across Second Life celebrate 10 years on the grid. So if you have an awesome place or a cool event, share your creations and we’ll make this a party for the ages. Since we can’t stop thinking about SL10B, we figured we’d stick with the theme of parties and celebrations. For those of you who prefer something quiet and intimate, we’re bringing you haute cuisine in a waterfront restaurant. For the more raucous, be sure to check out a neon kaleidoscope of a dance club and a music and art venue carved out of a subterranean cave. A literal rock cave, if you will. And if you feel like taking a break, why not take a walk through a soothing park or an exquisite Italian town? Any occasion or celebration is a good time to visit Casa de Aromas, the author´s cuisine restaurant. Casa de Aromas is the first haute cuisine restaurant in Second Life with superior dining service. they even offer special thematic menus for babies and kids, as well as happy meals to take home. Visit them soon! 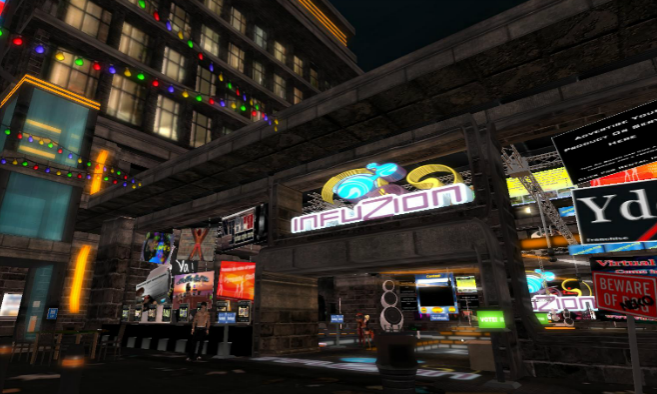 Club InFuZion is located at the heart of NekoZone Central, a visually stunning urban-themed sim. So why not drop by, get your urban on and listen to all the latest dance and club tunes? Everyone is welcome to come and party/chill in this friendly atmosphere. See you all there, huh? Bliss Gardens Park is a beautiful four-sim nature area below the Luna Bliss Home & Garden store — a delightful place to explore, take in the breathtaking scenery and much more. 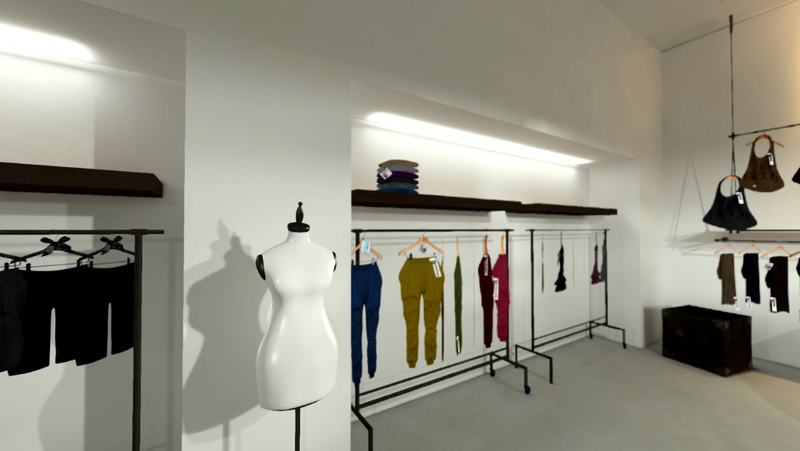 Visit the new Egoisme Milano for a real Italian shopping experience! Browse the stores for fashion, skins and free gifts or sit with friends and listen to music under the glass-domed roof. This mesh build is a wonderful place to take photographs and even hosts art galleries and live events. Live the dolce vita, at Egoisme Milano. We’ve been working hard on some major changes to Second Life’s Viewer and back-end infrastructure to improve the Second Life experience for all users. Today, we’re pleased to share an update on Project Shining - an initiative that will make avatars load and rez more quickly and reliably. for more about the project. 1) A required Viewer update, out now! 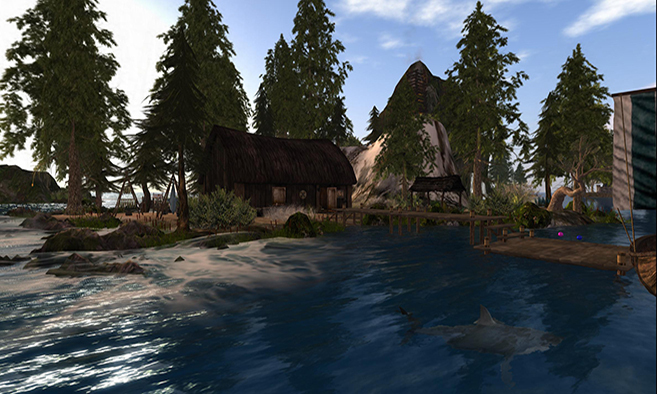 The official Second Life Viewer (version 3.5.1 and later) includes important updates you’ll need to enjoy the benefits of Project Sunshine, so update today if you haven’t yet. Actively updated Third Party Viewers also already have Sunshine-enabled versions available. 2) A server-side update, rolling out soon. It’s at this point that you’ll begin to notice significant improvements in avatar and object load times and reliability. But if you haven’t updated your Viewer, avatars won’t look right to you when we roll out the server update, so seriously, update now! 3) A second Viewer update, released after the server-side improvements are rolled out. As long as you have the Viewer 3.5.1 or later (available now), avatars won’t look wrong for you, but this second Viewer update will be needed to get the full benefits of Project Sunshine. Get on your way to a better, faster, and more reliable Second Life experience and update to the latest Viewer today! Linden Lab is excited to announce the launch of the Materials Beta Viewer! This Viewer will allow content creators to build objects using normal and specular maps and will allow users to view the effects of this new feature set. The end result is photorealistic textured objects inworld. Normal maps provide modelling of fine scale surface textures at far lower cost (to performance and Land Impact) than the equivalent geometry, while Specular maps, along with advanced specularity controls, provide much richer control over how the surfaces of an object interact with all the light sources in a scene. Together, these new features provide creators in Second Life much greater ability to make detailed and responsive content appearance. Setting any material property on an object will change the accounting method to the current accounting from the old count-the-prims accounting; in most cases, this will mean that you can get lower object cost for detailed or varied surfaces that would otherwise require more prims to create. It also means that Materials objects will have improved simulator performance and mesh object upload cost by decreasing the complexity of object geometry. This new set of features has been developed in collaboration with open source Viewer developers and content creators. New pages on how to best leverage these features and optimize the Land Impact of your creations are being published on the Good Building Practices wiki and the Content Creators Guide, and more will be added in the coming days by Second Life content creators and builders from Linden Lab. Download the Beta Viewer from the official downloads page. 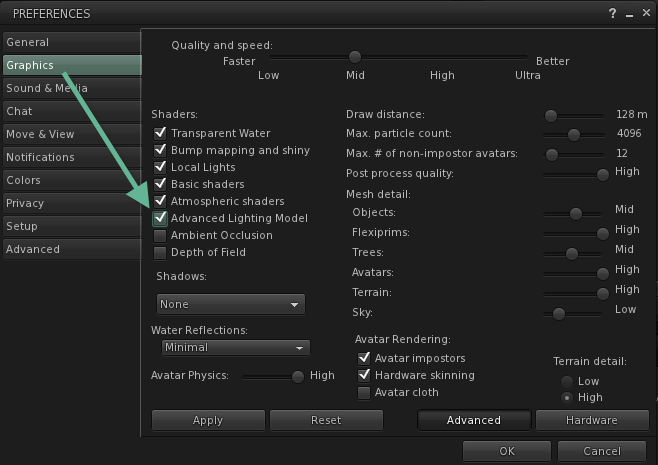 To see the new effects in this Beta Viewer, you must enable 'Advanced Lighting Model' in Preferences > Graphics > Advanced (this preference used to be called 'Lighting and Shadows', but actually controlled a wider range of rendering behavior, so the name has been changed). Once we have squashed all the beta bugs (which you can file in the MATBUG JIRA project), we will be pushing the Materials Beta Viewer to Release. Check back here for updates! 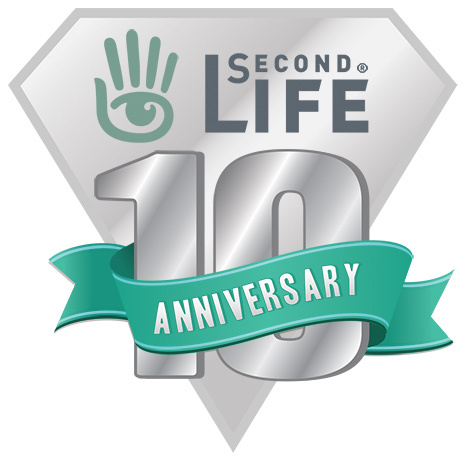 Celebrate a Decade of Second Life! 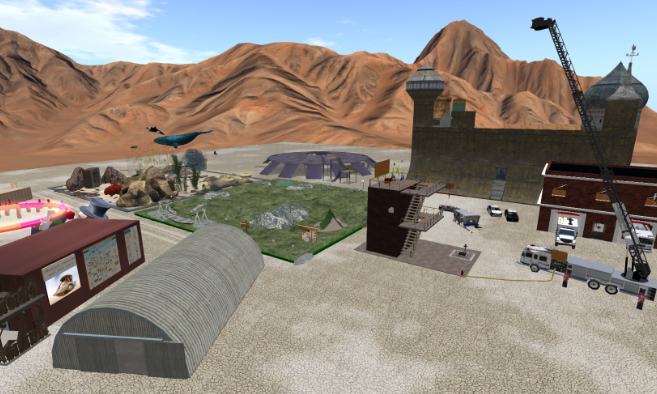 This month marks ten years since Second Life first opened to the public in June of 2003! We’re incredibly proud of Second Life’s success and longevity and we hope that all of you are too - it’s thanks to everyone who has made Second Life part of their lives over the past decade that we’ve reached this major milestone. We’ve planned some special things to celebrate SL10B that we’ll be rolling out throughout the month - be sure to keep an eye on this blog to be kept up-to-date with the latest! Starting today, you can get a free, special-edition SL10B avatar on the Marketplace. This avatar is made with some of the new Materials features and will look even better once that Materials Viewer launches (you can also check it out with the Materials Beta Viewer). Visit the SL10B Marketplace and get your commemorative avatar today - they’ll only be available until the end of June! We’re also kicking off an SL10B Snapshot Contest! Start snapping your celebratory images and get ready to share. Top prize is free use of a homestead for four months, and second and third prizes are free use of a homestead for two months. Check out the rules and submit your entries here. Throughout June, there will be celebrations for Second Life’s tenth birthday (SL10B) all over the grid - thrown by DJs and event planners inworld. So that you can keep track of where the parties are at, we've launched an SL10B Category in the Destination Guide. If you have an SL10B event planned - there is still plenty of time to submit your entry; and check back frequently - we’ll be continually updating the Destination Guide as always. 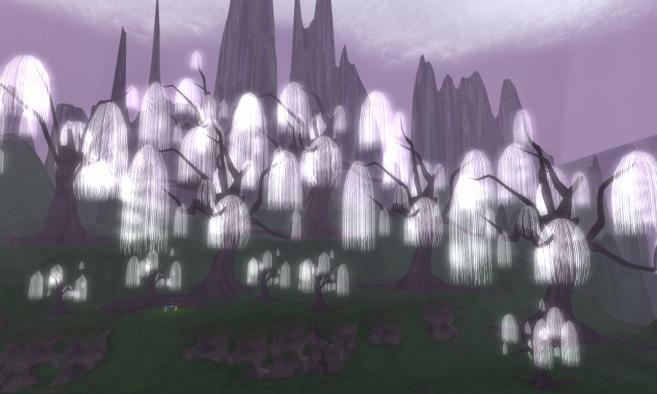 From June 16 - 29, there will be a large community-organized celebration inworld as well. As with past Second Life birthday celebrations, you can expect great exhibits, music, and events. For more info, check out the SL10B Community Celebration website. Later this month, we’ll be kicking off a special grid-wide hunt with unique prizes, exclusively for Premium members. We’ll blog with more details soon, but if you want to get in on the fun, be sure that your Premium membership is up-to-date. We’ll also be releasing some limited-edition gifts on the Marketplace and inworld. Some will be limited quantity - so stay tuned to find out when and where to get them! There’s more coming to celebrate Second Life’s tenth birthday, so be sure to keep an eye on this blog for the latest. Thanks again to everyone who has been a part of the last ten years in Second Life - we look forward to what is still to come! The Second Life 10th Birthday celebrations kicked off with a bang last week - and there is plenty more to come. To highlight just a few things that have been going on - here is your guide to ensure you get the maximum benefit of everything SL10B. SL10B Bear Avatar - made using the new materials feature. Learn more about materials and get the Materials Beta Viewer now. 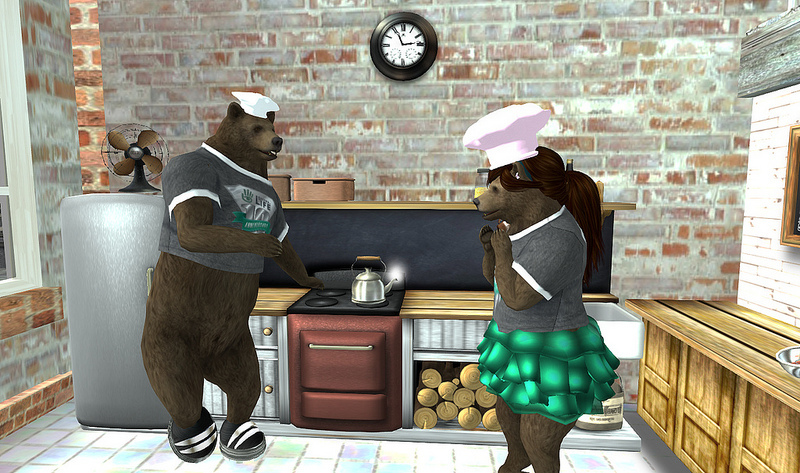 Already, nearly 7,500 Bear Avatars have been claimed on the Marketplace, and we’ve started to see some great snapshots being shared. Here are just a few that have been featured as Second Life Pics of the Day this week. Keep ‘em coming! We love it! "This year linden bear, tell me I am a cutie!" , photo by Isanelli Anatine. "Teddy Bear Picnic" , photo by Serena Snowfield. 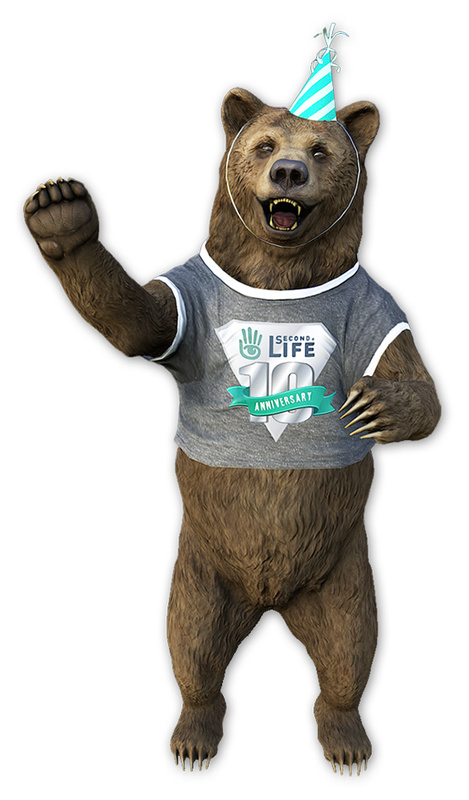 Take your own Bear Avatar or other celebration snapshots and submit them the SL10B Snapshot Contest for a chance to win a homestead prize! Submission have started to come in for the SL10B Category of the Destination Guide - for example check out SL10B By Us - an intersim event celebrating Second Life’s 10th Birthday. 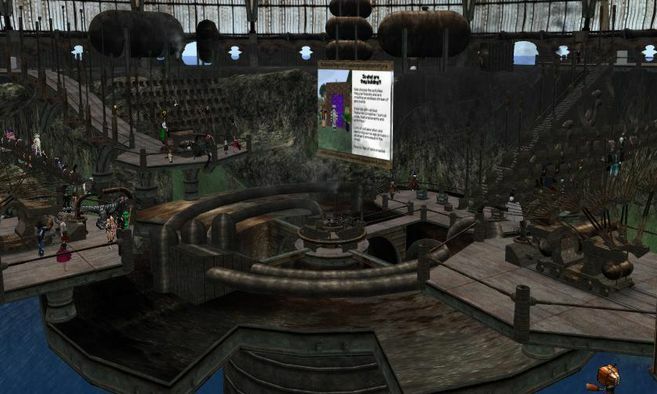 SL10B by Us is an intersim event for the 10th birthday of Second Life. Each day brings new ways to party: DJ's, live performances, shows, readings and much more. You'll also find loads of freebies, a hunt, even information for newbees. It opens June 9th, visit http://potpourrimarkets.wix.com/sl10b for more information. You can submit your events for consideration to this category and look out for more community events. There is more in store for the rest of the month - including the upcoming Premium members grid hunt, more limited special items, and the SL10B Community Celebration event that kicks off later this month, so continue to watch this space for the latest! It’s hard to believe that we’re halfway through the month already - but we’re still in full party mode for Second Life’s 10th Birthday. To start - there is an all new party pack available on the Marketplace, chock full of great celebration items including tasty treats, party favors and a bottle of the celebratory beverage of your choice. It’s free and only available until the end of the month - so get yours now. Here is a quicklist of the other items available on the Marketplace. Get your goods before the month’s end - then they will be gone for good. Starting today - Premium members can enjoy a grid-wide hunt with exclusives prizes. Not a Premium member but want to participate? It’s not too late - sign up for a Premium account, and you can join the hunt right away. Magellan Linden has uncovered an evil scheme by mad Doctor Talpa, to build some form of mind-control machines and take over the world. Magellan is busy building a machine to counter this scheme, but in the meantime YOU are needed to gather materials and components -- and to destroy any of Talpa's machines you can find. 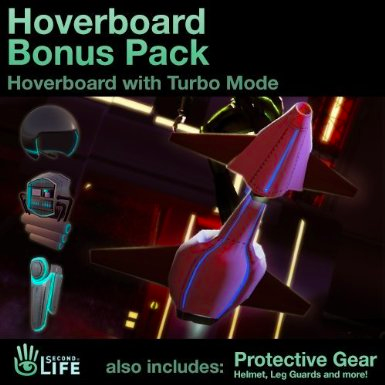 There’s more fun to come this month, so remember to stay tuned and watch our Facebook and Twitter feeds for late-breaking details about limited items that will be available inworld at the user-driven SL10B Community Celebration soon. These items will be collectable, so get ready to claim yours fast! Get the New Materials Viewer Today! Linden Lab is excited to announce the release of the Materials Viewer! This Viewer will allow content creators to build objects using normal and specular maps and will allow users to view the effects of this new feature set. The end result is photorealistic textured objects inworld, such as the SL10B Bear Avatar, which will look even better with this Viewer. to demonstrate the effect of Materials inworld and show builders how to add normal and specular maps to their creations. In order to view Materials, you will need to have a Viewer that supports this feature and have Advanced Lighting Model checked under your graphics options. Not all systems will support this option; please see the Materials FAQ for more information on whether or not it is supported on your system. Additional documentation, including case studies, can be found on the Good Building Practices wiki and the Content Creators Guide. We’d like to extend our thanks to developers from Exodus, Firestorm, and Catznip for their contributions to this feature. We are very excited about the result! 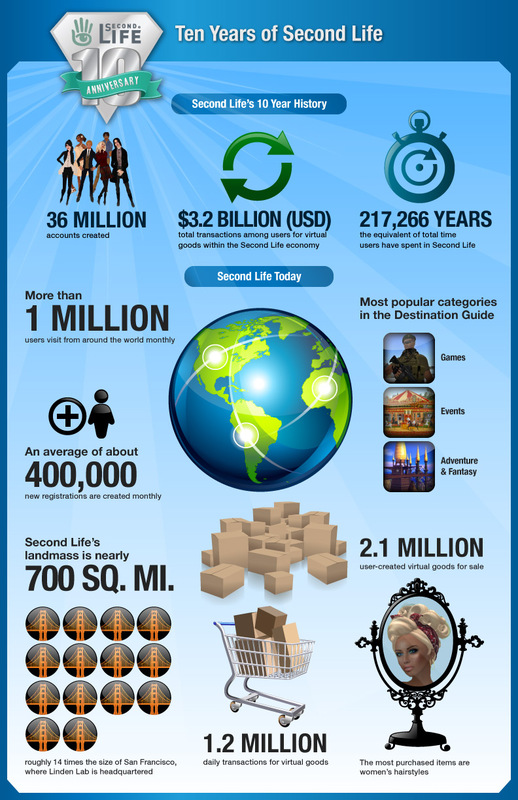 In honor of Second Life's tenth anniversary, we've released an infographic with some fun facts and stats about the virtual world over its history and today. You can check it out below, or over in the Press Release section of LindenLab.com. Celebrate SL10B With a Chance to Win a New Alienware 14 Laptop! Note: this contest is limited to Second Life users in the US; for full contest rules and legal information, visit the link above. 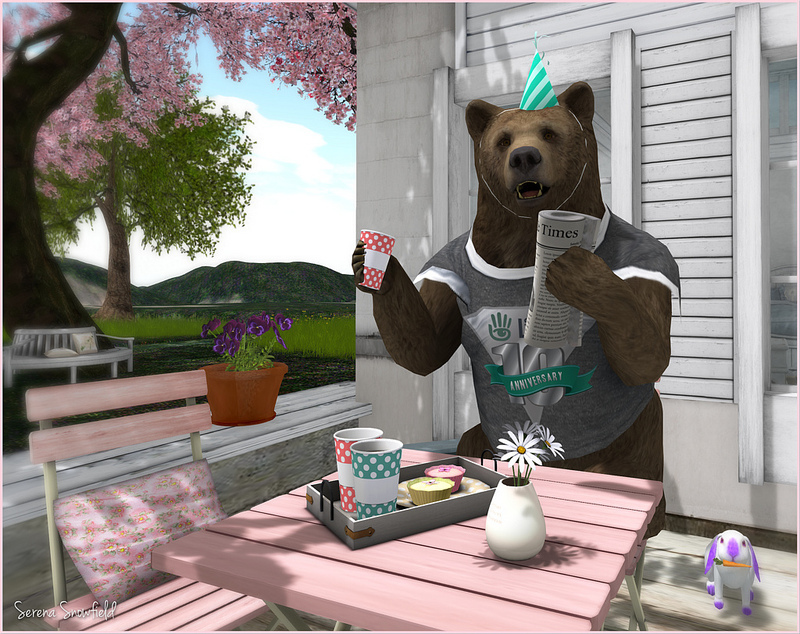 We’ve hit the final stretch of this year’s Second Life Birthday celebrations! It has been a great month full of amazing events, plenty of swag, and good times, and there is still lots of fun to be had in honor of SL10B. 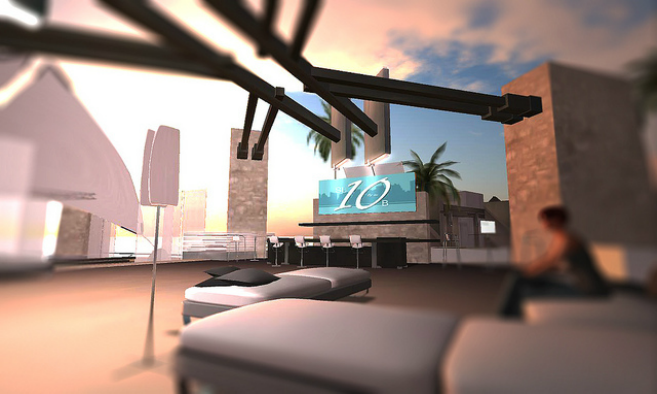 Thank you to everyone who has participated in celebrating a decade of Second Life - we hope you’re having a great time! Don’t forget to share some of your SL10B snapshots for a chance to win a prize in the SL10B Snapshot Contest. Snapshot contest ends June 30th - so get your entry in before the 11:59pm PT deadline! Premium members - you still have time to complete the exclusive grid hunt! 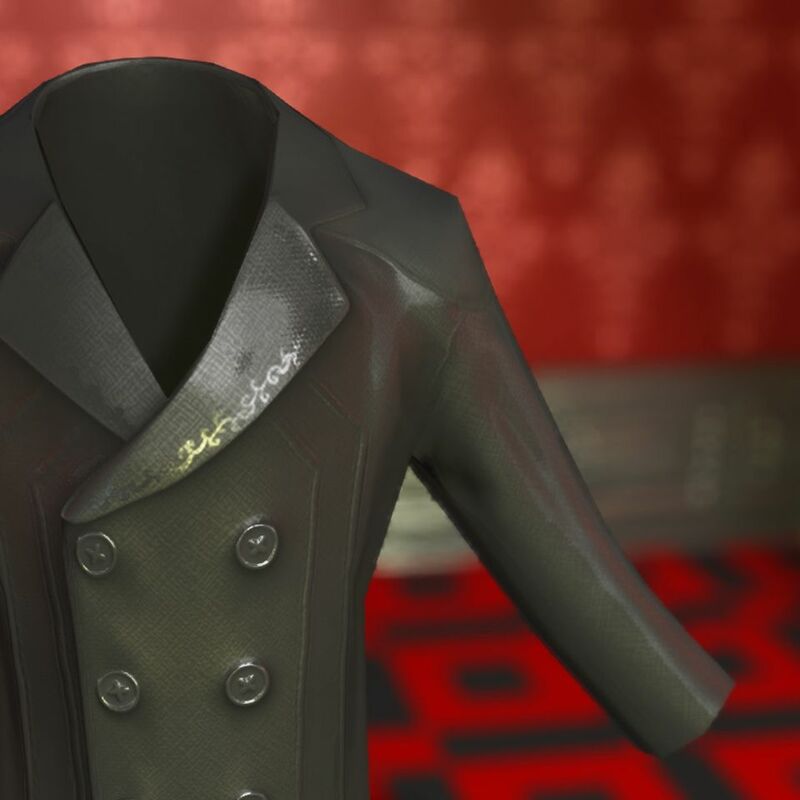 There is still some time to collect your limited edition inworld-exclusive items to commemorate the occasion. Visit the SL10B Community Celebration regions and look for the vending machines to collect your bears, jackets, furnished homes, and more. Regions will close to the public on June 29th. Remember to grab your special edition items on the Marketplace before they are gone. Already more than 12,000 SL10B Bear Avatars, 5,000-plus SL10B Mesh T-shirts, nearly 3,000 SL10B Fireworks, 2,800 SL10B Old Style T-Shirts, and thousands of SL10B Resizable Baseball Caps and SL10B Party Packs have been claimed! Our co-promotion with Alienware is still ongoing, and you have until July 17th to enter for a chance to win a new Alienware 14 laptop! See contest details for eligibility, rules, and legal information. Welcome to Blue Tsuki's SLB10 art installation: The Tightrope of our Affection. This installation is an elegant immersive visual experience culminating in a self-referential meditation. 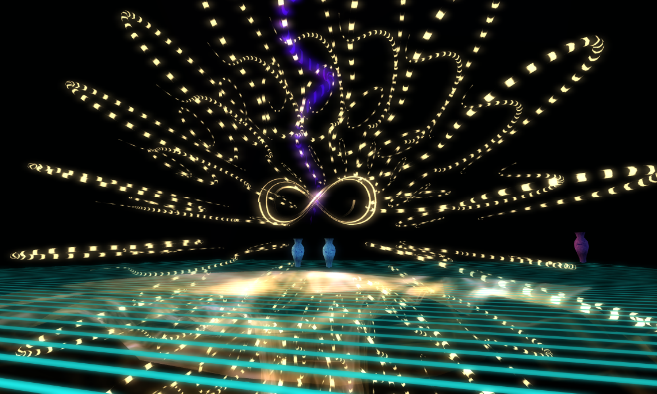 Come see this celebration of virtual world installation art. Over 50 avatars share their evolution from the beginning of their second lives to today. Enjoy Your Second Life Evolution, built by Harper Beresford of A Passion for Virtual Fashion at http://slfashionpassion.wordpress.com. Burn2 celebrates 10 years of Second Life be looking at the unique role Burning Man had during its conception. See artist renderings of Burning Man's 10 principles, live music and lots of fireside chats. The principles were crafted not to dictate of how people should be and act, but as a reflection of the community's ethos and culture as its organically developed from inception. Machimina artist Draxtor Despres continues to showcase his explorations within Second Life this week as he discovers the deliciously demented minds behind MadPea Games. Founded by Second Life resident Kiana Writer, MadPea brings together a collective of talented designers, storytellers, and game creators from around the world to create some of the best immersive storytelling experiences on the grid. Scripters from Holland manipulate the game mechanics with 3D modelers from the United States in real-time, while designers from Germany, France, and the U.K. help test gameplay. It is truly a global collaboration! MadPea has built a strong reputation in the community for intellectually stimulating games that combine clever puzzles, cool graphics, and unexpected surprises. (as previewed in the video above). 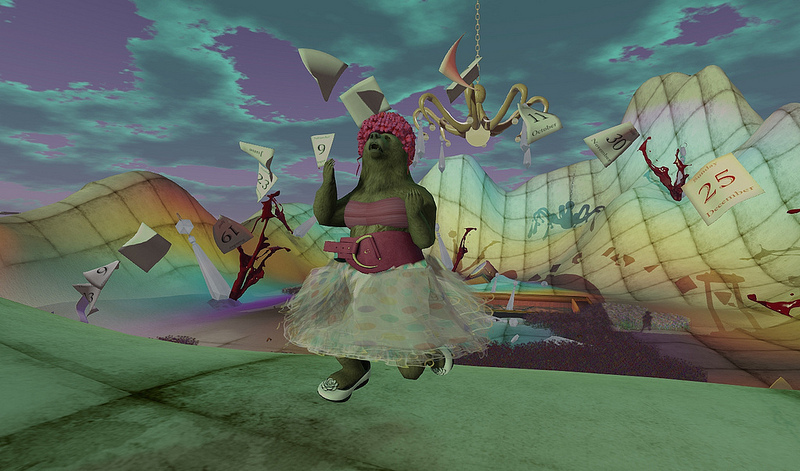 Madpea’s Kiana Writer explores Second Life. It’s Time to Update Your Viewer! As we’ve previously blogged about, the next step for Project Sunshine, which will improve avatar loading performance, is a server-side update. Early next week, we will be starting to roll out those changes, which are the “heavy lifting” portion of Sunshine. Once the updates have rolled out, all avatar data will be rendered on Second Life’s servers, rather than on your computer. Because your local machine won’t have to render that data, you should start to see better reliability and improved performance across the grid. It’s important to remember that you need to be using an up-to-date Viewer to enjoy these improvements. If you’re still using an outdated Viewer, the server-side changes rolling out now will cause you to see some avatars as broken or incomplete. Soon all avatars will be using the new system and will appear broken to you if you don't update. So don’t be left out in the cold, update your Viewer today, and let the Sunshine in! It’s summer in Second Life, and summer’s the season for really great events. Tired of that old, worn-out hairstyle? 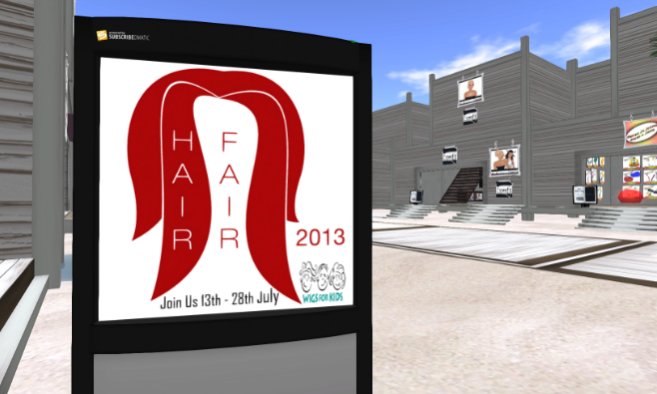 Hair Fair is one of the largest events on the grid, opening this Saturday and running through July 29th. A portion of all proceeds go to Wigs for Kids, a nonprofit that provides hair replacement systems for children in need. So update that old pompadour, what’s stopping you? We’d also like to recommend 2013’s Relay for Life, July 13th through the 14th. 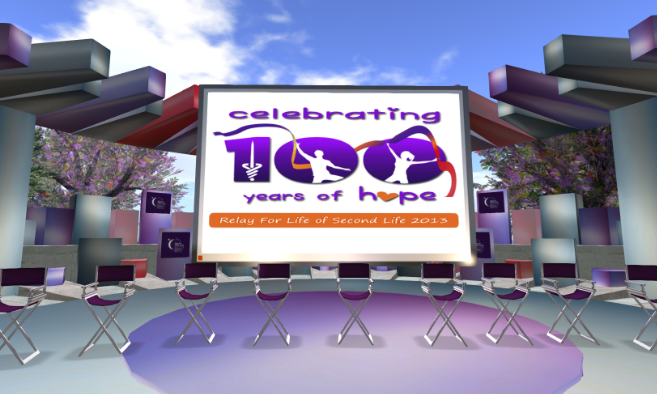 Come join the American Cancer Society in Second Life as they raise funds and awareness in the fight against cancer. With raffles, art shows, live music and more, this relay is a good time for a great cause. We always love seeing your events as they unfold. If you have an event you would like to share, let us know and submit your own. See you inworld! Support Wigs for Kids and update to the newest hairstyles at Hair Fair 2013. Come see hundreds of brand new styles spanning four sims, only available during this fun event with a percentage of every item purchased going to Wigs for Kids. Hair Fair is from July 14th through the 29th, be sure to visit http://hairfair.wordpress.com for more information. The American Cancer Society's Relay For Life has been an active and continually growing event for over nine years. This life-changing relay runs from July 13th through the 14th. Come join individuals from across the world as they celebrate survivors, remember loved ones and raise money for the fight against cancer. For more information, be sure to visit http://bit.ly/12pW3Ho. We’re pleased to announce an update to Second Life pricing for educational and nonprofit institutions. Effective immediately, any accredited educational institution or any organization with a 501©(3) charitable non-profit tax status (or equivalent) is eligible for a 50% discount on private region set-up costs and a 50% discount on private region maintenance costs. As long-time Second Life users will note, the discount on maintenance costs is similar to a discount previously offered to these organizations. More recently, after reviewing our pricing, we have been offering this discount directly to individual organizations, but today we are happy to formalize this pricing, extend the discount to also include set-up costs, and open applications for all that are eligible. For more details on the offer, including how to apply, please see the wiki page here. Organizations eligible for this discounted pricing are also eligible for invoicing of the private region costs. Invoices must include a minimum of six months of maintenance. Additional details can be found here. In our quest to uncover and share the new and wonderful inworld creations, we spend a lot of time delving into Second Life. So without further ado, we’d like to highlight a little bit of what jumped out at us this month. For you investigative types, we have an ultimate hunt for... well, stuff, and a fiendishly difficult search for those interested in a challenge. Rounding things out are a beautifully rustic Viking village, a lovingly re-designed shopping center and a triple-tiered nightclub to let out that wild side. We always love seeing your creations, so join in the fun and submit your own. See you inworld! With over 220 designers, new home products and the latest in men's fashions, the Ultimate Stuff Hunt is a month-long hunting extravaganza. Find unique items to make your house a home or try out that new look with bold fashions and intricate accessories. And don’t forget the free gifts at the lounge. The hunt starts on August 2nd, so get down here! 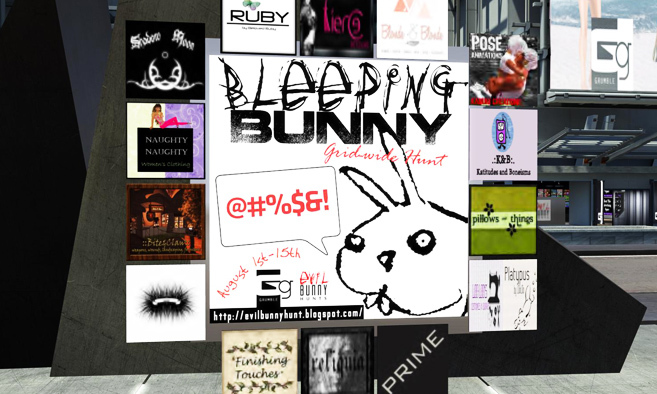 Welcome to the Bleeping Bunny Hunt, a hunt so hard you'll want to curse! Every designer is providing a hint, a riddle or a scavenger hunt to find those pesky exclamation points. This hunt is meant to be hard. If it was easy, why do it? You'll encounter decoys along the way, but stick with it for your just rewards. The Bleeping Bunny Hunt runs from August 1st through the 15th, so don't wait. Syrinx is a beautiful and authentic Viking village. This moderate, non-combat location includes period-appropriate buildings and activities, they've even got the animals and plants native to Scandinavia. There are many places to engage in chores, spiritual and cultural exploration, relaxation, chores, adventure and maybe a little romance. Beware of sharks and bears! "Keep up Darling, we'll hit the Men's level next!" "But Babe, what about the alien shooting game?" The Mothership landed in Second Life with a fabulous range of mesh clothing and accessories for ladies and gents by Zed Designz. 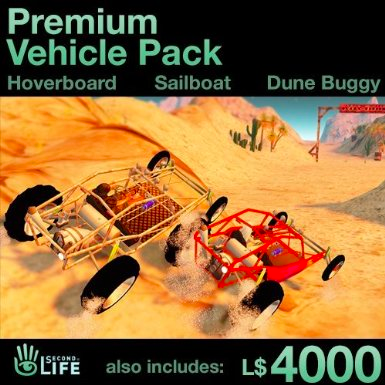 Arrive in style by monorail then enjoy lucky chairs, hunts and fabulous prizes. Shop 'till you drop and party through the night at Club Zed. Travel to the world of music with Equilibrium Night Club! Come see talented live musicians and DJ's from every corner of the globe in three unique atmospheric zones. Enjoy live concerts at Music Garden, shake your body at Dance Hall and don't forget to bring your sweetheart to VIP Hall while you bask in the views of the city. Friendly to all races, so come on by. In this episode of the Drax Files, join machinima artist Draxtor Despres as he showcases his explorations in Second Life with an interview with Elie Spot, co-owner of Mon Tissu and Celoe in the Mayfair sim. Soothing design and bold fashion at Celoe. And if you haven’t caught up on the earlier Drax Files, now’s a great time to start. Check the links below or visit Drax’s website at draxtor.com. This week, the server component of Project Sunshine will go live across the entire grid! 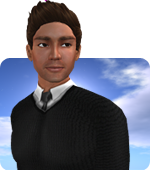 This means that all the improvements we discussed in our previous post will be available to everyone in Second Life. It’s important to remember that you need to be using an up-to-date Viewer to enjoy these improvements. If you’re still using an outdated Viewer, the server-side changes rolling out now will cause you to see some avatars as broken or incomplete. As of this week, all avatars will be using the new system and will appear broken to you if you don't update. If you haven’t already, please update your Viewer now and enjoy Sunshine! If you keep an eye on Linden Lab announcements, you might have seen that we recently acquired Desura, the community-driven digital distribution service that puts the best games, mods and downloadable content from developers at gamers’ fingertips, ready to buy and play. 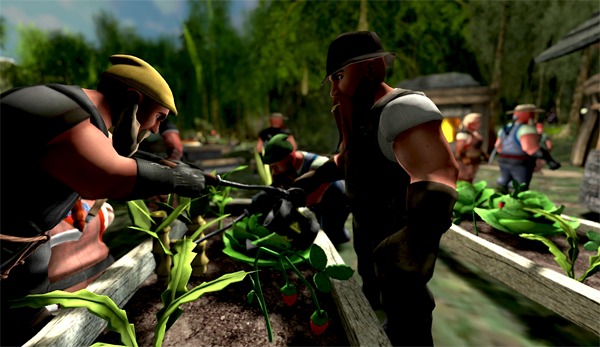 Now, Second Life is available on Desura (oh, and Patterns is too)! You can still access Second Life as always, but this now makes it easier for anyone with a Desura account to get into Second Life as well. If you have friends who are Desura players, help spread the word! 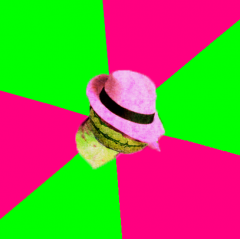 And, if you’d like to check it out yourself, it’s free and easy to create a Desura account. Machinima artist Draxtor Despres is at it again, this time with an uplifting interview with Robin Sojourner, best known in Second Life for her texture tutorial and wonderfully crafted skins and clothing. As always, be sure to catch up on previous Drax Files at Drax’s website and below!